New season, new trends. Whether or not you like to keep up with the fashion industry's constantly changing styles, this is one trend that could stick around for a while. We're talking khaki, not military. Khaki. Okay, I get it. Right now you're either picturing the washed-out bucket hat that your grandfather would wear fishing, or the skin- tight bodycon dresses that every Kardashian family member wears out to brunch/ their dog's photoshoot/ by the pool for an Instagram post. But trust me when I say that khaki can be alternative, as well as fashionable! If you want to rock this trend in a unique way, find our best style picks below to mix your alternative style with this neutral color to keep you cool all summer. The khaki trend doesn't have to be in your face- sometimes the best alternative style accessories are ones with simple details. I love this cool bag styled by the blogger behind Maisy Meow- the khaki trim paired with the red stitching makes for the perfect combination. 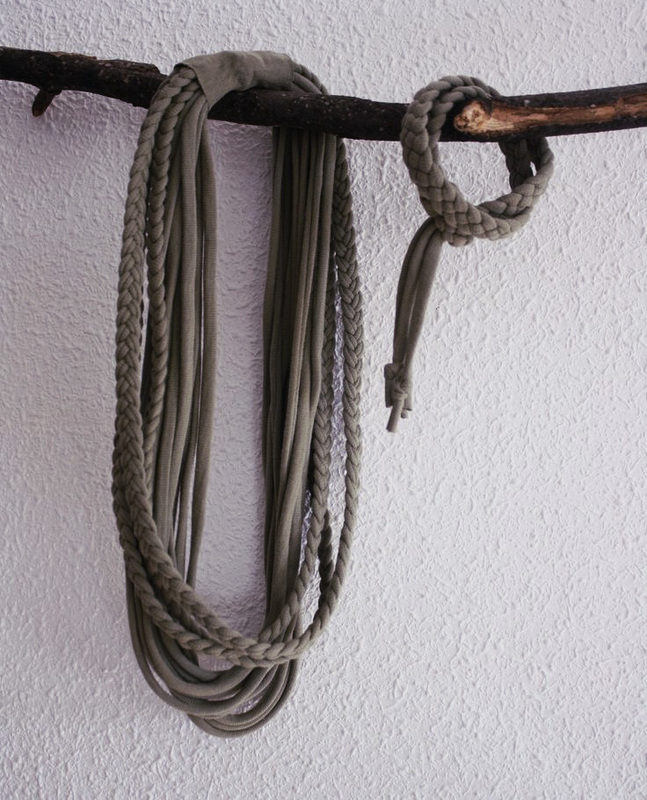 Another great khaki accessory I stumbled upon is this recycled t-shirt braided necklace. This one is also a fun DIY project- simply cut up an old t-shirt into strips, fold the strips vertically, and sew a hem to make a clean rope- shaped necklace. Follow a more in-depth tutorial here if you want to work a little DIY magic into your alternative wardrobe. Fashion blogger Julie Sariñana kills the game when styling multiple trends together- here, she is rocking the denim trend with her casual lace- up dress and khaki sneakers (and crossbody bag). Khaki sneakers are great in a lot of ways- they won't get as dirty as white shoes, they're practical and can be worn with almost any outfit, and they're just cute, okay? While Julie styles her sneakers with a summer dress, you can wear these shoes throughout every season. Add some more personality to your look by pairing your khaki shoes with colorful anklets or fun socks. Yeah, fun socks. Don't act like you don't own a pair with pizza, dogs, or Chewbacca on them. If you tend to like the bohemian side of fashion, go for a tie- dye khaki top to switch up your summer style. I love this jacket paired with khaki pinstripe pants- it's the perfect mixture of a clean cut and utilitarian- inspired style. If you're a t-shirt type of guy or girl, tie dye your own shirt with khaki tones- there's no better way to create a unique style than to do it yourself! While this could also technically be a dress, I love this embroidered olive/ khaki button down. This would be a piece that I would slip on over a unique swimsuit or a cute bikini to wear to the beach, and button up to go to dinner afterwards. 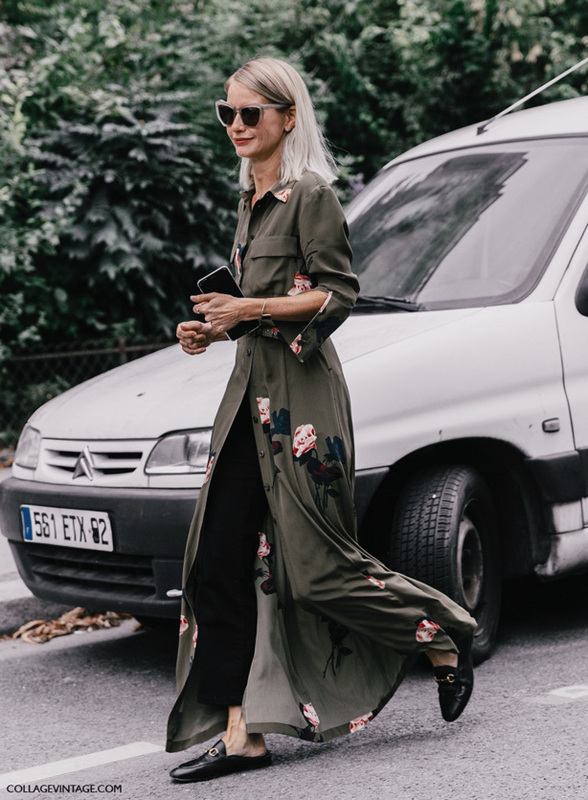 Duster tops and kimonos are the perfect garments for summer- lightweight and easy to throw over just about any outfit (or in this case, wear by itself). Make sure to look out for fabrics like cotton and linen when shopping for your summer wardrobe to stay cool! Ain't nobody got time for sweat stains. You don't have to be Jake from State Farm to wear khakis. In fact, we think that you can wear them way better. For a comfy summer look, try out harem pants in a khaki shade. These pants are super easy to throw on with a pair of cute flats, sandals, sneakers, or even some high heels if you want to dress up your outfit. Look for details like buckles, studs, and cinching to create a unique look. Since harem pants have a loose silhouette, try tucking in a t-shirt or wearing a bodysuit that contours to your shape to create balance. What do you think of the khaki trend? Let us know what you think in the comments below!